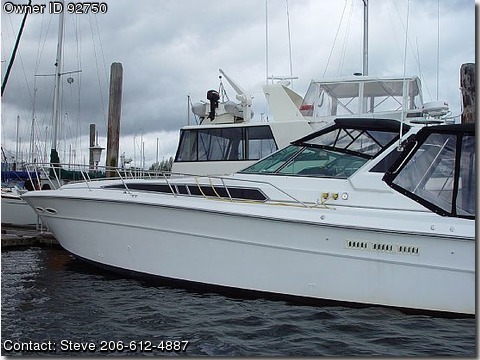 Call Boat owner Steve 206-612-4887. 2 acs, am/fm stereo, anchor, bimini top, bilge pump, cb radio, carpet, coast guard pack, compass, depthfinder, dockside power, full canvas, full gauges, galley, generator, gps, halon, head, hydraulic steering, radar, radar arch, refrigeration, rod holders, shower, stove, storage, swim platform, trim tabs, tv, vcr, 6 batteries, vhf radio, windlass, sleeps 6, documented, refurbished 2011, prof maintained, pics on request, 3rd owner, forward and starboard cabins, nibral props, 39x13'10 Sea Ray express cruiser in excellent condition, 45'loa, 2 staterooms, galley, head, separate shower, settee, cokcpit seating for 12 with new upholstery, new custom inner spring king mattress in master, twin mercruiser 7.4L bluewater gas engines 2011 port-7hours, 1999 starboard 770 hours, 380hp fuel injected, 9kw genset 2kw inverter charger, 2 ac heat pumps, radar, gps chartplotter, vhf, cb, hdtv, vcr, dvd, acdc fridge, icemaker, 3 burner stove, microwave, compressed air system for toys and hadley air horns remote spotlight, vacuflush head with 44 gal holding tank, 100 gal water 300 gal fuel capacity, windlass anchor, 200ft chain 300 rode stern anchor, 8-12' glas ply dingy with tohatsu 9.8hp motor, camper back canvas with stratoglass, suitable for trips us to 2 weeks long as far as SE Alaska. Soft riding, very sea worthy.